The Transit of Venus is the big event this month. A transit occurs when either Mercury or Venus appears to move across the face of the sun. While the two planets appear in between the earth and the sun at inferior conjunction, every 116 days for Mercury, and 584 days for Venus, they rarely move precisely between the two celestial orbs. 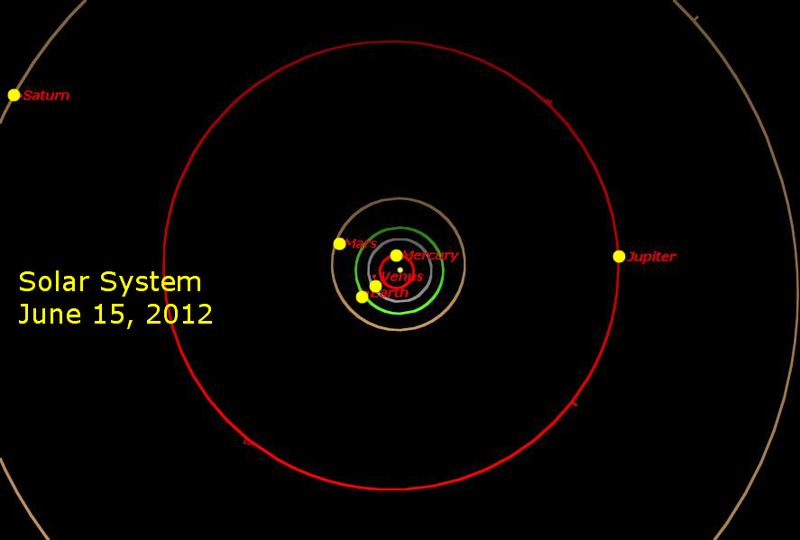 The orbital planes of the solar system are nearly in the same plane, but not exactly. Mercury’s orbit is inclined about 7 angular degrees compared to Earth and Venus is about 3 angular degrees. In our sky, the sun’s apparent angular size is only about 0.5 degrees. So as Mercury and Venus revolve around the sun and pass between our planet and the sun, they rarely pass exactly in between Earth and sun. So they usually pass above the sun or below it when they go through inferior conjunction. The rare times when they go exactly between, they can be seen crossing the sun’s face. The last Transit of Venus was in June 2004. Before the 2004 event, the last Transit of Venus was December 6, 1882. After the June 5 transit, the next one is December 11, 2117 followed by a second nearly eight years later on December 8, 2125. Since the invention of the telescope, there have been 7 Venus transits. Edmund Halley first realized that transits could be used to measure the distances of the planets from the sun. Before precise measurements, distances were measured in Astronomical Units (A.U. ), the relative distances of the planets from the sun as perfected by Copernicus. The distance feat was attempted by measuring the time Venus took to cross the face of the sun. The timing indicated the distance. Today distances are accurately measured with radar. The discovery of extrasolar planets is made by observing transits with space borne telescopes. With Venus transit cycles occurring every 130 years, this is one story you won’t likely hear about from a living ancestor. As the image above indicates, the transit is not a spectacular visual event. Venus appears as a small dark dot against the brilliance of the sun. It will be unimpressive! Take all precautions that you would when observing a solar eclipse. For more information about the Transit of Venus, read this web site. The video below displays the event as seen from the Chicago area. The transit begins at 5:09 p.m. CDT as the planet begins to move in front of the sun. By 5:27 p.m. CDT, Venus is completely visible on the face of the sun. The planet continues to move across the face of the sun. By 8:29 p.m., Venus reaches the midpoint in its transit, although the sun sets at 8:24 p.m. CDT in the Chicago area. The transit continues with the sun below the horizon with it leaving the sun’s face at 11:49 p.m. CDT. After Venus passes inferior conjunction, between Earth and sun with the accompanying transit event. It pops into the morning sky. On June 17 using binoculars and from a good observing spot with a clear horizon, look for a clustering of Jupiter, the moon, Venus and Aldebaran. This is only about 25 minutes before sunrise. 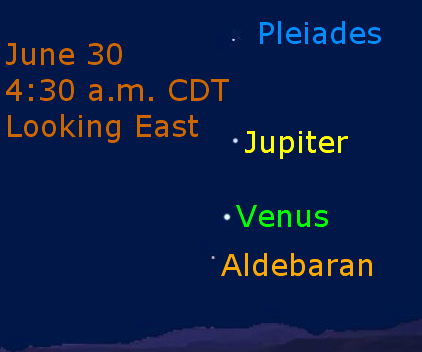 By month’s end Venus, Jupiter, and Aldebaran stand higher in the sky during predawn hours. The above chart shows the planets, star and the star cluster Pleiades on June 30 at 4:30 a.m.
At the full moon on June 4, the Chicago area will see the beginning of a partial eclipse. Starting at 3:48 a.m., the moon begins to move through the earth’s outer shadow. For the most part, this phase of the eclipse is not different from observing a typical full moon. As the eclipse progresses, it sets at 5:25 a.m. The partial eclipse is visible from the Pacific Ocean. While this year’s weather has been ahead of the season, summer begins at 6:09 p.m. on June 20. At this point the sun reaches its point farthest north of the equator. We observe the sun rising far north of east and setting far north of west. The sun reaches its highest point at noon (1 p.m. with Daylight Saving Time), although it is not exactly overhead. Mercury appears in the western sky at mid-month. On June 21st, the moon passes nearby. The chart above shows the region at 9 p.m. The chart shows the sky only 30 minutes after sunset. With binoculars and a clear horizon, locate the moon, Mercury and the twins Pollux and Castor. 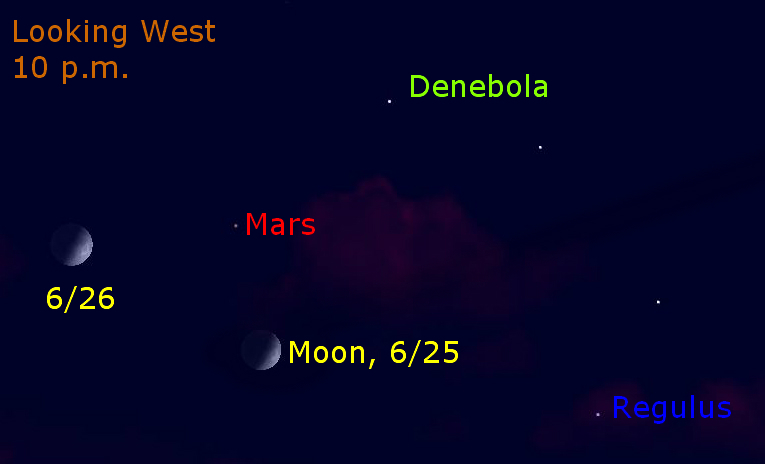 Mars appears in the western sky with the moon on June 25 and June 26. Look in the western sky after it darkens. Mars appears in front of the stars of Leo with Denebola and Regulus nearby. 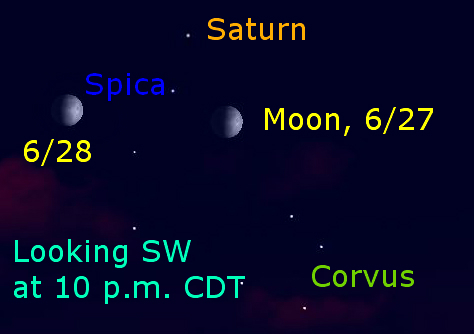 After the moon appears near Mars, it moves near Saturn on the evenings of June 27 and June 28. 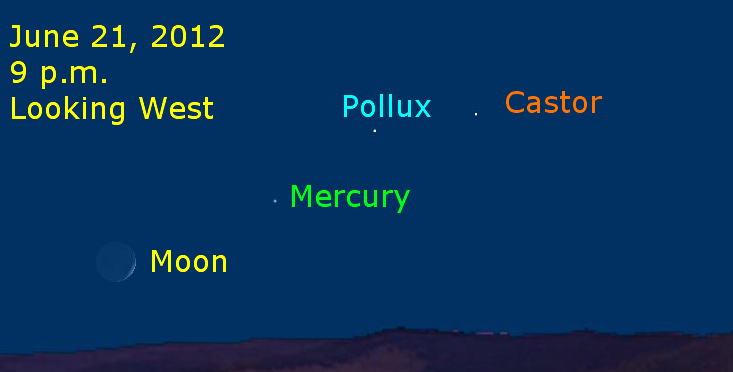 This chart shows the positions of the “naked eye” planets on June 15, 2012. (Click on the image to see it larger.) Venus has moved between the sun. Jupiter is on the morning side of the sky with the other planets on the evening side of Earth. 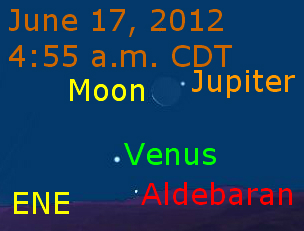 June 2012 provides several opportunities to view the sky. Use a safe filter to observe the Transit of Venus. Enjoy the longer days of the month and the views the sky presents.